We are one of the reputed manufacturers of FRP Vessel in India which are manufactured in our ISO 9001 : 2008 certified manufacturing unit. 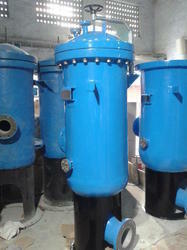 Here each Vessel is put to rigorous quality control tests like Hydro test, Burst test, Weight Test. Our filament winding expertise and exposure to technology complement our diversified and ever-growing product portfolio. With complete solutions from design (Including structural and Industrial) to manufacturing, we have a list of products to our range. All bolts and nuts of SS 316. 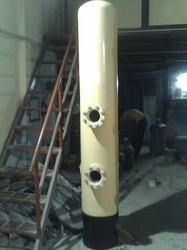 We are renowned names in the industry, manufacturing and exporting a comprehensive range of FRP Pressure Vessel. Our entire product range is corrosion resistant in nature and exceptional finishing standards. These are provided in different specification to meet the diverse requirement of client. With the assistance of experienced and dedicated professionals, we offer our clients functionally advanced range of Customized FRP MP Vessel. They have smooth finishing standards and are dimensionally accurate in nature. They are highly durable and are corrosion resistant in nature. We offer them in different technical grades and are valuable at most affordable rates. Owing to years of experience in the industry, we offer our clients dimensionally accurate range of MB Vessel. These products are durable in nature and are quality tested on varied well-defined parameters. We offer them in varied capacities and are light in weight. Our entire product range is easy to handle and are offered at most affordable rates. Quality being the main concern, we offer our clients an extensive range of FRP Pressure Bladder Vessel that are treasured among the clients for durable standards and wide industrial applications. These products are corrosion resistant in nature and are functionally advanced in nature. Furthermore, we offer them at most affordable rates. Keeping in mind the diverse requirements of the clients, we offer technically advanced range of FRP Surge Suppression Vessel that are manufactured with utmost accuracy. Our entire product range is sturdy in construction and has high compressive strength. We test them on varied parameters thereby delivering world-class range of products.